The United States Navy and NASA have had a working relationship for over 55 years now and they continue to complement each other in many different aspects of space exploration. This relation was forged way back in the late 1950s when NASA first began to look for pilots to become Astronauts that would eventually fly aboard their new Mercury spacecraft. In fact three of the original seven Mercury astronauts came from the ranks of the Navy. Wally M. Schirra, Scott Carpenter, and the first American to go into outer space, Alan B. Shepard, were all Navy pilots. The Air Force added three of their own to the program, Gordon Cooper, Gus Grissom, and Deke Sleyton. Then toss in one famous Marine named John Glenn, and you’ve rounded out the original seven. To date, there have been 330 NASA Astronauts, 201 of them have come from the military, and of that 201, 83 of them were from the Navy. That puts them in the number 1 spot, for now at least, beating out the Air Force by just two astronauts. And it’s not just astronauts that the Navy provides to NASA, they provide other services as well, but we’ll get to that a little later. First some pioneering astronauts from the Navy that you may have heard of. 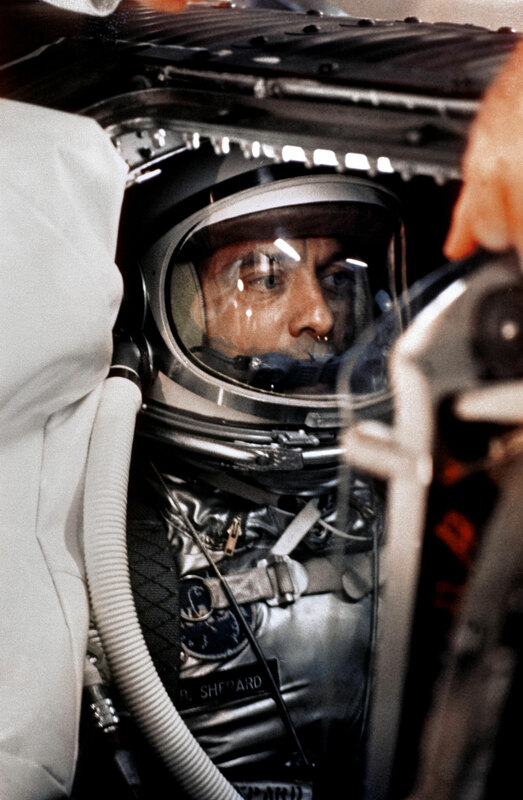 Astronaut Alan B. Shepard Jr. was born in East Derry, New Hampshire on November 18, 1923. After graduating from the U.S. Naval Academy in 1944, he served in World War II aboard the destroyer Cogswell. After the war he attended flight training school and earned his wings in 1947 and went on to be a test pilot on many different aircraft. He logged more than 8,000 hours of flying time, 3,700 hours in jet aircraft, over his career. He went on to become one of the original Mercury astronauts and became the first American to go into space on May 5, 1961. Inside of the Freedom 7 spacecraft, he was launched into space by a Redstone rocket on a ballistic trajectory suborbital flight. The first American in space enjoyed just a 15 minute flight that carried him to an altitude of 116 statute miles and to a landing point 302 statute miles down the Atlantic Missile Range. With astronauts today staying six months aboard the International Space Station, that hardly seems impressive, but in 1961 it was a tremendous accomplishment. An inner ear problem discovered later in his career grounded him from flying again, but he remained at NASA as Chief of the Astronauts Office with responsibility for monitoring the coordination, scheduling, and control of all activities involving NASA astronauts. Following an operation on his ear, he was restored to flight status in May of 1969 where he began to train on the Apollo program. He went on to become the fifth American to walk on the Moon as Commander of Apollo 14. He spent a total of 9 hours and 17 minutes exploring the surface of the Moon. Much to the surprise of just about everyone, at NASA and elsewhere, he even hit a couple of golf balls up there. Neil Armstrong was born on August 5, 1930, in Wapakoneta, Ohio. He grew up with a fascination with airplanes and flight at an early age, having learned to fly at the age of 15, before he could drive a car. He went to Purdue University where he obtained a Bachelor of Science in Aeronautical Engineering. He later earned his Master of Science in Aerospace Engineering from the University of Southern California. His studies were interrupted in 1949 when he was called to serve in the Korean conflict, where he flew 78 combat missions as a Navy Pilot. After the war, Neil left the Navy and returned to his studies. So unlike many of his fellow Navy Astronauts, he was not still in the Navy when NASA selected him to become an Astronaut, but he’s included here since he made a few important contributions during his career at NASA. In 1955 he joined the National Advisory Committee for Aeronautics (NACA), which later became the National Aeronautics and Space Administration (NASA). As a test pilot and engineer, he flew many high-speed aircraft, including the X-15, which could reach a top speed of 4,000 miles per hour. Over the course of his career Neil flew over 200 different aircraft including helicopters, jets, and of course rockets. 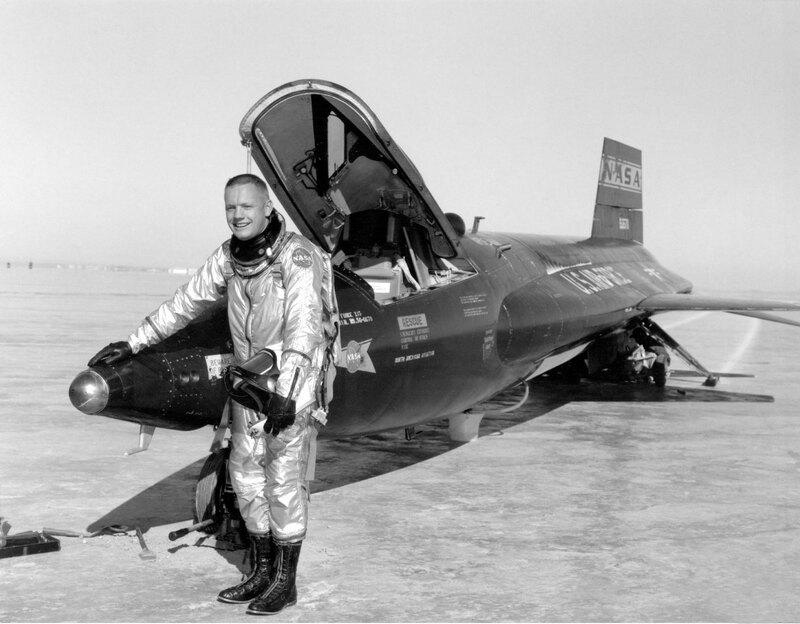 Selected to the second group of Astronauts in 1962, Neil went on to command the Gemini VIII mission in 1966. This would be the 6th manned Gemini flight and the first to perform a docking with the unmanned Gemini Agena Target Vehicle (GATV). The primary mission objectives were to perform rendezvous and four docking tests with the Agena target vehicle and to execute an Extra Vehicular Activity (EVA) experiment. Other objectives included parking the Agena in a 410 km circular orbit, performing a re-rendezvous with the Agena, and some other tests and experiments as well. Armstrong and his co-pilot Astronaut Dave Scott launched on March 16, 1966 and spent the next six hours catching up with the GATV which had launched an hour and forty-one minutes earlier. They docked their spacecraft with the GATV at 5:14 PM. Approximately 27 minutes later the docked spacecraft began to roll, after attempts to stop the docked spacecraft’s roll, Armstrong undocked from the GATV. This however sped up their rotation; the crew then managed to shut down the Orbit Attitude and Maneuvering System (OAMS) that is used to control their spacecraft and brought up the reentry control system (RCS), which is normally only used when it’s time to reenter the Earth’s atmosphere, in a final attempt to stabilize their tumbling spacecraft. Their efforts were successful, and after 25 minutes of tumbling they were now stable in orbit. However due to them bringing up the RCS, they were now going to have to end their mission early per mission rules so the remaining maneuvers, EVA, and experiments would not be performed. However due to their quick thinking, extensive training, and skills as pilots, they saved what could have been a disaster. Armstrong flew one more mission for NASA which you may remember him for, that being Apollo 11, mankind’s first landing on the Moon. Armstrong will always be remembered as the first man to walk on the surface of the Moon. That however, would have not been possible had he not been the first man to land a spacecraft on the surface of the Moon. The landing turned out to be more of a challenge than anyone had anticipated. Neil and his Lunar Module Pilot, Buzz Aldrin, encountered problems with the computer during the powered descent, Program Alarms kept displaying that they were working through with Mission Control in Houston. The computer controlled the Lunar Module (LM) through much of the descent phase, so any abnormal alarms were disheartening to say the least. While all these alarms were popping up, Mission Control was trying to determine what they were, the crew was making sure their machine was still flying correctly, and the landing spot was getting closer and closer. On a lunar landing, the Astronauts can’t even see the surface until the LM pitches over. Since Neil and Buzz were still dealing with some program alarms when the vehicle pitched over, Neil didn’t get a good look at where the computer was targeting them to land until they were only about 2,000 ft. above the surface. That’s where they saw a very rocky area and Neil quickly decided to retarget the landing site, further down the flight path, or land long as it is known. Manually flying the LM, he pushed the vehicle as quickly across the surface as it would allow, slowing their descent and moving some 1,100 feet to the west before finally finding a suitable landing spot. There Neil dropped the LM down and set the vehicle down for the very first manned landing on the Moon. Their estimated burn time for the descent was 11 minutes and 58 seconds but they actually took 12 minutes and 34 seconds. They were definitely low on fuel, estimates indicate they had about 45 seconds of fuel left, which in reality would mean about 25 seconds as they needed 20 seconds of fuel to steady the spacecraft and abort the landing. Of course Neil would probably never have aborted; he’d have landed it anyway. 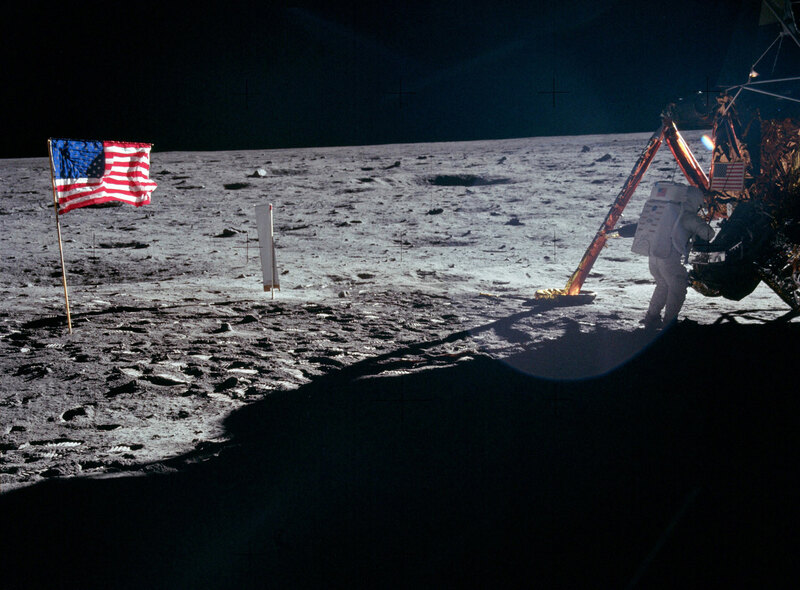 Later that day, we all know that he and Buzz Aldrin spent about two and a half hours walking on the surface, collecting samples, setting up experiments, and cementing their place in history. After leaving NASA in 1971 Armstrong went on to teach Aerospace Engineering at University of Cincinnati for 8 years and then served as the chairman of Computing Technologies for Aviation, Inc., from 1982 to 1992. Neil passed away on August 25, 2012. His crewmate and fellow moonwalker Buzz Aldrin summed it up best, “Whenever I look at the Moon I am reminded of that precious moment, over four decades ago, when Neil and I stood on the desolate, barren, yet beautiful, Sea of Tranquility, looking back at our brilliant blue planet Earth suspended in the darkness of space, I realized that even though we were farther away from earth than two humans had ever been, we were not alone. Another Navy Astronaut, William Shepherd, was born July 26, 1948 in Oak Ridge, Tennessee. However if you ask him, he calls Babylon, New York his hometown. He too attended the U.S. Naval Academy where he earned a Bachelor of Science degree in aerospace engineering. However, unlike many of his fellow Navy astronauts, he did not go down the path of a pilot, instead he served with the Navy’s Underwater Demolition Team Eleven, SEAL Teams One and Two, and Special Boat Unit Twenty. This was a much different path to becoming an astronaut then most other Navy astronauts before him. Captain Shepherd was selected as an astronaut in 1984 and went on to fly three Space Shuttle missions. STS-27, his first mission was a mission for the Department of Defense. Space Shuttle Atlantis launched on December 2nd, 1988 on a 4 day mission. In its payload bay was a satellite named ONYX, the mission was to simply release it into orbit, however upon release, one of the antenna dishes failed to deploy. The crew retrieved and repaired the satellite before releasing it once again. Repairing the satellite would have required an unscheduled spacewalk which Shepherd and fellow crew member Jerry Ross would have had to perform. But that’s all just speculation, in truth, only the Astronauts and some people at NASA and the DoD really know what happened since the mission, was, and still is, classified. His next mission would be STS-41, while not a classified mission, it was never the less, very important. On board was the European Space Agency’s Ulysses spacecraft which they were to send on a mission to the sun to explore its polar regions. The mission was a success, Ulysses made it to the Sun and spent 18 years orbiting our star carrying out its studies. His last Space Shuttle mission would be on STS-52 which launched on October 22nd, 1992. The primary mission was the deployment of the Laser Geodynamic Satellite also known as LAGEOS-II. Other mission experiments were also performed and Columbia returned to a landing at the Kennedy Space Center on November 1st, 1992 after a highly successful mission. That, however, was not the end of Captain Shepherd’s career as an Astronaut. 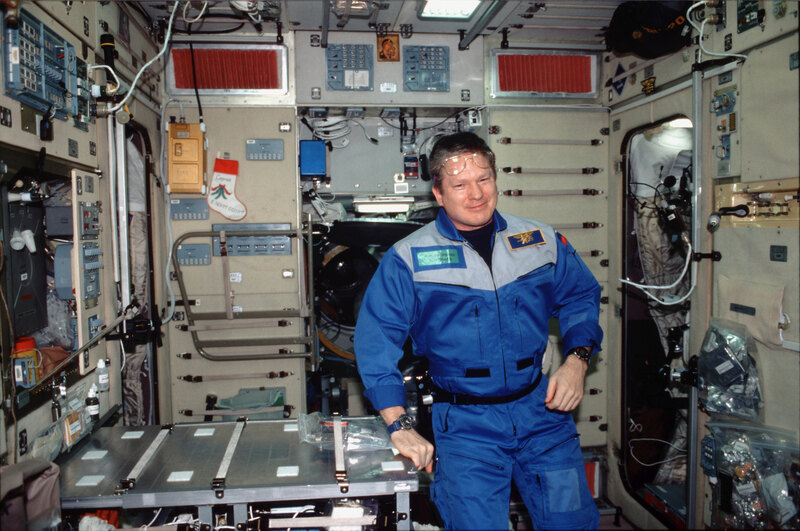 He did fly one more time aboard a Russian Soyuz spacecraft, blasting off on October 31st, 2000, and docking to the newly born International Space Station two days later. He and his crew of two Russian Cosmonauts spent almost 6 months as the very 1st crew to man the orbiting outpost. They were responsible for getting everything working inside and preparing the station for future crews and future expansion of the outpost. This was quite the daunting task to say the least, which could be why NASA put an Ex-Navy SEAL in command. Captain Shepherd returned to Earth aboard the Space Shuttle Discovery on March 21st, 2001. That would be his last time flying in a spacecraft, as he retired from NASA in 2002, but you can go outside and see his work flying overhead still today. In 1981, NASA was preparing to launch its next generation spacecraft, the Space Shuttle, for first time ever. All previous manned spacecraft were tested unmanned before allowing a crew on board. But NASA was putting a crew on the maiden flight of Columbia and that crew would be another all Navy crew. The primary mission objectives for STS-1 were to accomplish a safe ascent into orbit, check out all the systems on the orbiter and to return to Earth for a safe landing. This would also be the first time a manned spacecraft launched with Solid Rocket Boosters. 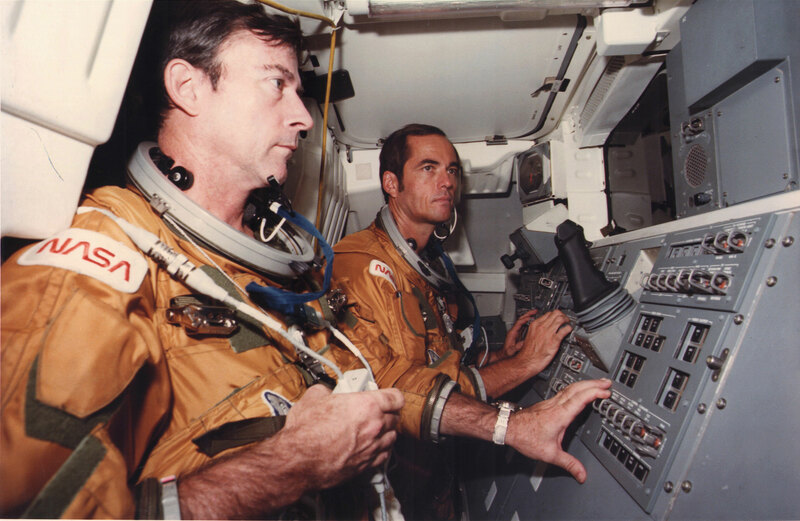 The commander of STS-1, John Young, was again from the Navy, and another pilot. John attended the Georgia Institute of Technology where he earned a bachelor of science degree in aeronautical engineering before entering the Navy. He was a veteran of four spaceflights prior to STS-1, including the first manned Gemini mission, Gemini 3, where he operated the first computer ever used on a manned spacecraft. He took the Commander’s seat on Gemini 10 where he and Pilot Mike Collins completed multiple rendezvous with two different Agena target vehicles. Later as Command Module Pilot of Apollo 10, John flew to the Moon for the first time where he, Commander Tom Stafford, and Lunar Module Pilot Gene Cernan would test the entire Apollo landing process. Back in the Commander’s seat for Apollo 16, Young along with Lunar Module Pilot Charlie Duke, and Command Module Pilot Ken Mattingly went to the Moon on the fifth mission to successfully land on the surface. Young and Duke would spend almost three full days on the surface. Using the Lunar Rover they were able to cover over 16 miles of surface during their three moonwalks which lasted a total of just over 20 hours. The pilot of STS-1 would be Bob Crippen, this would be his first spaceflight after 12 years with NASA. Crippen, also a Navy pilot, attended the University of Texas prior to enlisting where he earned his Bachelor of Science degree in Aerospace Engineering. John Young would go on to command STS-9, his sixth and final spaceflight, while Crippen would fly as Commander for STS-7, which carried the first American woman astronaut, Sally Ride, into space, and again as Commander of STS-41C and STS-41G. While the STS-1 mission was a success, things were learned such as upon landing it was discovered that the orbiter had lost 16 Thermal Protection tiles and had damage to 148 others. An overpressure wave occurred when the Solid Rocket Boosters ignited and that caused the damage to the Thermal Protection system. Further modifications to the Sound Suppression System were made that helped minimize any damage to the TPS in later flights. Over the last 53 years of manned spaceflight there has even been the opportunity to have a number of all Navy crews fly a mission together. Apollo 12, the second manned landing on the surface of the Moon, was commanded by Charles “Pete” Conrad Jr. who was also a Navy pilot before entering NASA. His fellow moonwalker, Alan Bean, also known as the Lunar Module Pilot, was a Navy pilot also. Rounding out the crew was Command Module Pilot Richard Gordon, and yes, yet another Navy pilot. They were a very close crew and were friends before and after their mission. Apollo 12 launched on November 14, 1969 from Kennedy Space Center Pad 39-A. One of the more memorable events occurred 52 seconds after launch when the rocket was it by lightning, not once, but twice. This caused all three fuel cells, which provide power to the Command Module, to go offline. Flying on just their batteries in the Command Module, they were able to regain power and continue on with their mission. Unlike the first landing on Apollo 11, which touched down over four miles from where the intended landing site was, Apollo 12 intended to make a precise landing in the Ocean of Storms on the Lunar Surface. One of their tasks was to retrieve a piece of an unmanned lander, Surveyor III, which had been there for over two and a half years. Conrad piloted the Lunar Module, named Intrepid, to a landing just over 500 feet from Surveyor III. Conrad and Bean made two EVAs, spending over seven hours on the lunar surface. They deployed numerous experiments and sensors on the surface and returned about 75 pounds of lunar rocks and soil to the earth for study. Conrad and Bean went on to command different missions aboard Skylab, America’s first orbiting space station while Gordon retired from NASA in 1972. In order to better understand the side effects of a long duration spaceflight where the crew could be in microgravity for a year or more, NASA is currently preparing for a year-long mission aboard the International Space Station. Data from the mission should help NASA develop and/or validate countermeasures designed to reduce the effects of long exposures in space. This will help them with their goals of long duration Lunar missions and ultimately missions to Mars. Scott Kelly and Russian cosmonaut Mikhail “Misha” Kornienko currently are scheduled to launch aboard a Soyuz rocket to the International Space Station in March of 2015 and they will stay aboard the outpost for nearly a full year. 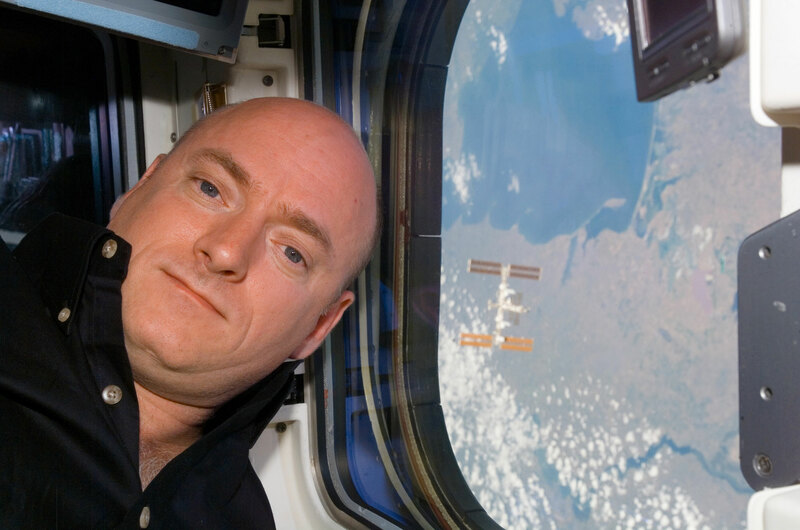 For Scott Kelly, a former Navy aviator, this will be his 4th spaceflight. On STS-103 in 1999 he was the Pilot on Discovery on what was the 3rd Hubble Space Telescope servicing mission. On STS-118 he served as Commander of Space Shuttle Endeavour on a ISS servicing flight which delivered a third starboard truss segment to the outpost. He launched to the space station again in 2010 and served as the Flight Engineer for Expedition 25 before assuming the role of Commander on Expedition 26 after the departure of the Expedition 25 Commander. While the Navy’s role in providing astronauts is one to be proud of. They offer many other services that NASA requires. Up until the Space Shuttle, all returning U.S. spacecraft landed in the ocean. From the first Mercury capsule carrying Alan Shepard, through the last Apollo flight, Apollo 17, with Navy pilot Eugene Cernan in command, and through the four Skylab flights, the Navy provided the ships, planes, helicopters, and personnel to retrieve the returning astronauts and their spacecraft from the ocean. One of the more recognizable recovery ships, the U.S.S. Hornet is now a museum in Alameda, California, that anyone can visit. The Prime Recovery Ship (PRS) for both Apollo 11, and Apollo 12, you can see where the first men to walk on the Moon were welcomed back to Earth. In all the Navy recovered five Mercury Capsules (Liberty Bell 7 was lost, but has since been recovered) and their Astronauts, 10 Gemini spacecraft and their crews, and 11 Apollo spacecraft and their crews from the ocean. They also retrieved Ham the monkey and his capsule and numerous unmanned test capsules. Most of the times, numerous ships were dispatched to the splashdown area since a precise landing did not always occur. One ship would be the Prime Recovery Ship (PRS), with the rest being Secondary Recovery Ship(s). 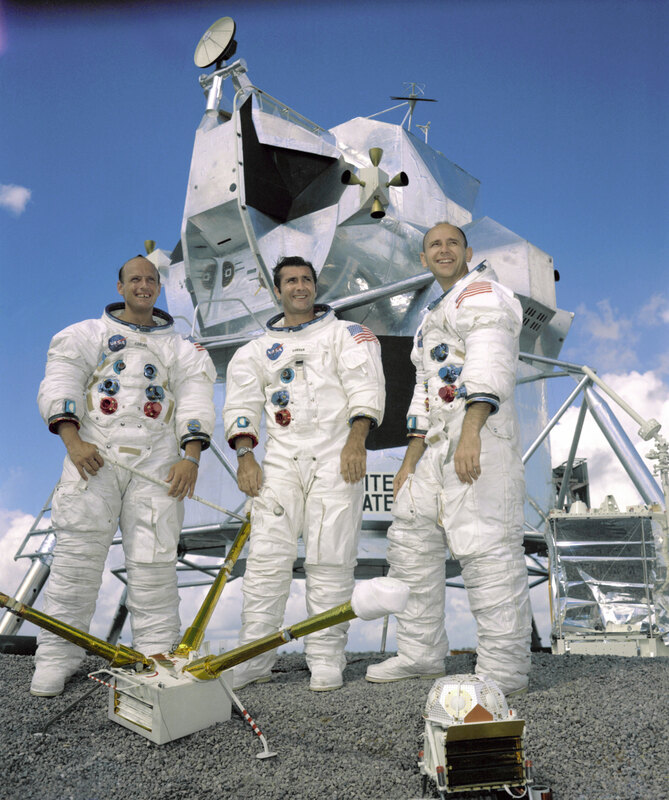 According to NASA’s history site, on three occasions a SRS actually performed the recovery in the Mercury and Gemini programs. These retrievals are not an easy task, with the capsule bobbing around in the ocean, sometimes in rough seas, divers and other Navy personnel put themselves at considerable risk accomplishing these retrievals but are always up to the job at hand. 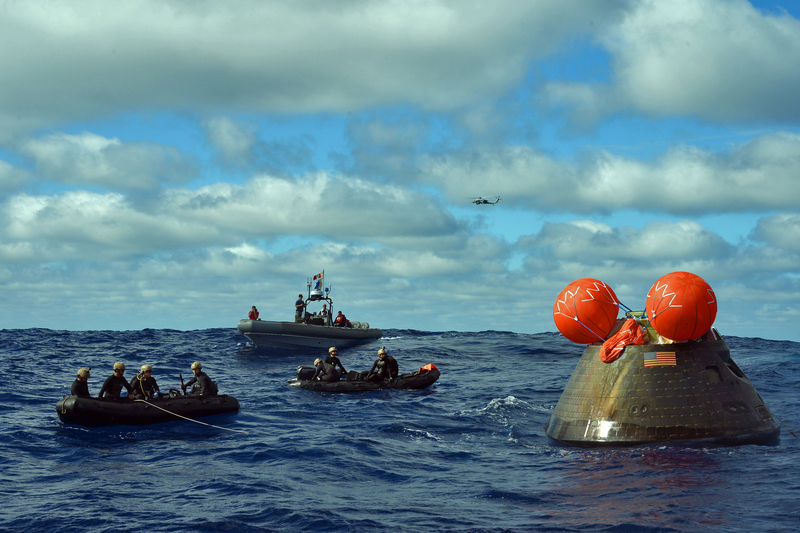 The Navy once again took up this role with the new Orion capsule; which made its first unmanned test flight on December 5th, 2014. Exploration Flight Test-1 was designed to test the spacecraft’s heat shield and other systems during a high speed re-entry at over 20,000 MPH. The heat shield will reach temperatures above 4,000 degrees Fahrenheit during re-entry. Once again the Navy worked with NASA on procedures and equipment to safely return the vehicle to the ship. This time however instead of helicoptering the capsule back to the ship, the Navy towed it inside a ship’s flooded Well Deck. Orion was secured against the bumpers in the well deck as line tenders on platforms inside the well deck help secure the capsule. Water was then drained from the well deck allowing Orion to be berthed onto its recovery cradle. In later missions, the crew will then be extracted. The Navy hopes to accomplish the entire process from splashdown to extraction in two hours or less. This is due to the spacecraft running on batteries to provide cooling and fresh air to the crew, and those batteries will only last about two hours. Not to mention the crew bobbing around in what is essentially a small boat, in rough waters, will not be a pleasant experience for them, particularly after being in a weightless environment for an extended period of time on a long duration flight such as those Orion will be used for. In the early days of manned spaceflight, NASA recruited pilots to become astronauts. They were already trained to fly and survive in a harsh environment if they needed to after a failure of their aircraft for any reason. With the advent of the Space Shuttle and afterwards, the International Space Station, more specialized Astronauts, known as Mission Specialists on Shuttle flights, are now required. Mission Specialists perform tasks such as servicing satellite, servicing the ISS, performing experiments, and other tasks that a military pilot might not have the advanced education and training to perform. So NASA turned to civilians and non-pilot military personnel to fill these new astronauts positions on the shuttle and ISS crews. One part of the astronaut candidates training is known as wilderness survival training. Whether launching on a rocket, or flying in an aircraft, a mechanical failure could land them in a very remote part of the world, so survival training is a must. Much of this initial training occurs at the Navy’s 12,500-acre Rangeley mountain wilderness training facility at Brunswick Naval Air Station. Here they will learn land survival, navigation, and field medicine. Since some of these new astronauts did not come from a pilot background, they will require similar flight and survival training as their pilot counterparts had. The Naval Air Station (NAS) at Pensacola, Florida has been providing training for Astronaut Candidates (often referred to as ASCANS) for many years now. The candidates receive water survival training, aviation physiology and flight training, including flight training in simulators, familiarization flights and instrument training flights. Once selected, the astronauts will travel a lot in NASA’s T-38 aircraft with an experienced pilot, so therefore flight training is essential to them. What a better way to end this article then with one more Navy tradition that has made its way into our human spaceflight program. Bells have been used in the Navy for a long time now. Among other things, they are used to signal the arrival or departure of important personnel, such as a Captain, Flag Officer, or other high ranking personnel. They are also used to signal a change in command. 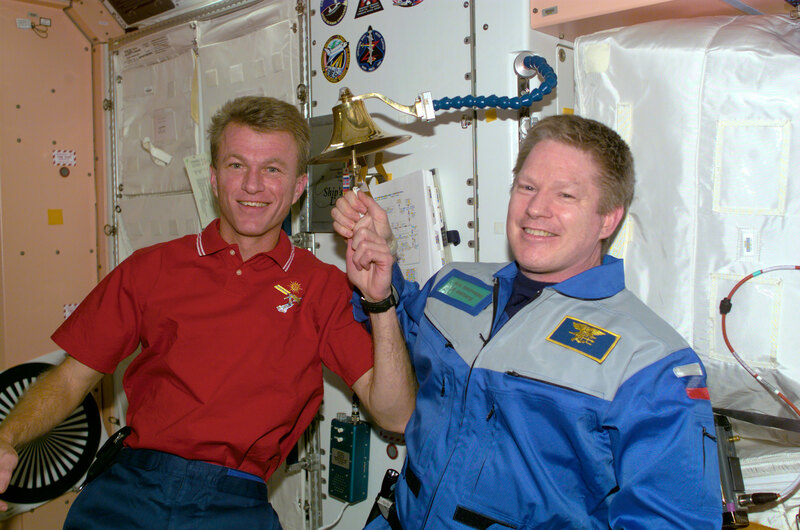 Today onboard the International Space Station, such a bell resides and is rung whenever a spaceship arrives or departs. So now we ring the bell and depart this story.